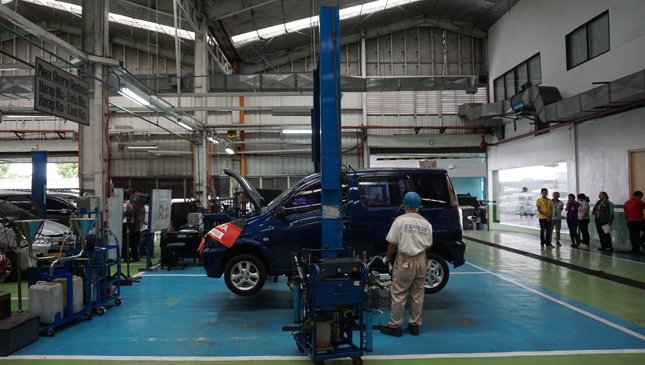 Toyota vehicles may be known for their reliability, but like all machines with moving parts, they have to be periodically maintained or you might find you and your car stopped in the middle of nowhere. Or worse, your ride might stall during rush hour and you’d earn the ire of other motorists. With the increasingly hurried pace of our daily lives (or maybe that’s just us), it’s becoming a challenge to find time for important tasks like car servicing. We all know it usually takes half a day; so we leave our car in the morning, then escape from the office again in the afternoon to pick it up. It’s a time-consuming but necessary ritual. 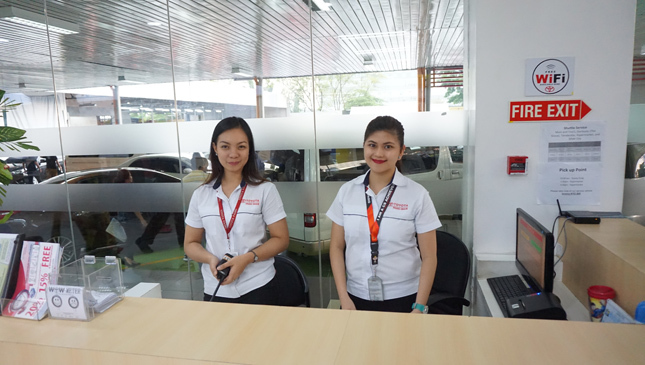 We recently discovered a new program of Toyota Motor Philippines that makes the process of servicing your vehicle a lot easier. The setup is called Toyota Express Maintenance Service (EM), and the tag line is "1 Hour Tapos!" This is currently available at all Toyota dealers nationwide. The process is simple. Just call your preferred Toyota dealership three days in advance for an EM appointment. Toyota recommends making afternoon arrangements to avoid the customer morning rush. In case of senior moments, the dealer will call you one day in advance to remind you of your appointment. Once you arrive at the agreed time, it only takes one hour from the time you sign the repair order until the service advisor notifies you that the servicing is done. After the hour is up, expect your car to be serviced, washed and vacuumed. 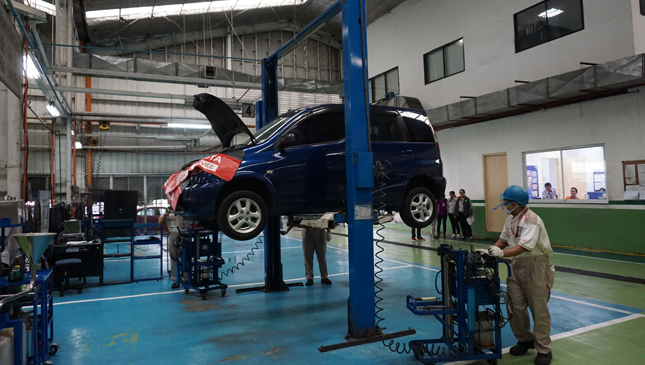 TMP offered to let us try the service, and it just so happened our Toyota Echo Verso was due for periodic maintenance. 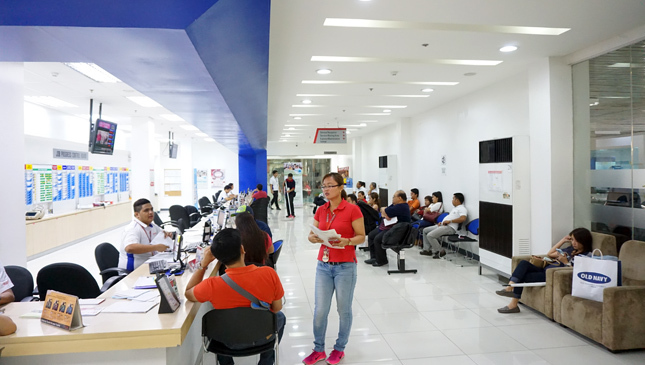 So one Saturday afternoon, we went to Toyota Pasig for a 3pm EM appointment. 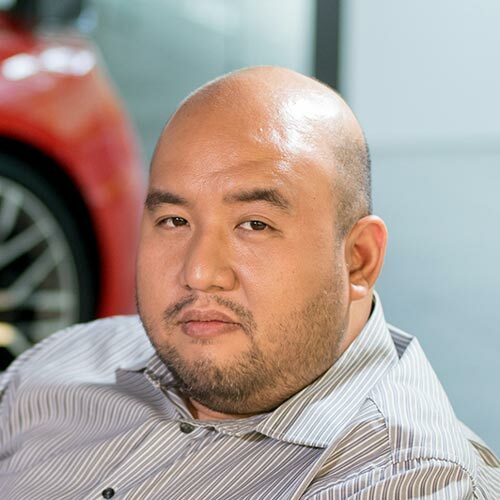 Our service advisor, Lawrence Antonio, was ready and waiting. He asked the usual questions, and then we went to the parking lot for the inspection. 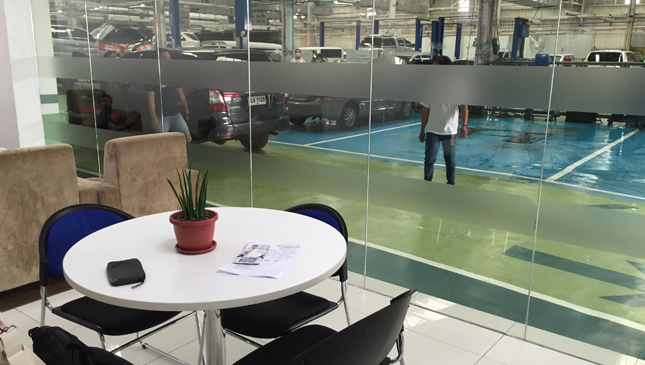 We were then led to Toyota Pasig’s waiting lounge, a simple but spacious area with glass windows that let the customers look directly at the service bays. Free water, juice, iced tea and coffee were available in one corner. There was free Wi-Fi as well. In the service area, the bays where the services were being done were colored blue, whereas the regular bays were painted green. The reason for the speed of service was that there were three mechanics, all wearing EM uniforms, who worked on our vehicle. According to Toyota, these personnel had to be of a certain job level to qualify as an EM mechanic. They were also using a special tool tray that could hold the tires, and this was also exclusive to the EM boys. True enough, just before the hour was up, Antonio came up to us and gave his recommendations and report. A few minutes later, we left Toyota Pasig with our car good for another 5,000km. It's important to note that this is for a typical periodic maintenance, and not for major repairs. 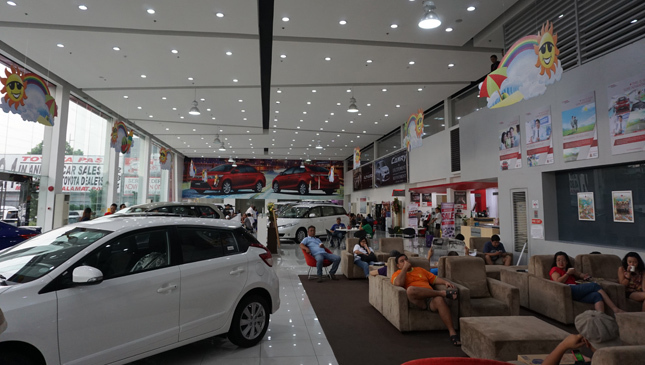 The dealership we went to--one of the biggest and most profitable in the country--was packed that day. So it really made sense to book an EM appointment. But we realize this also makes sense for Toyota, considering the rapid pace at which it is selling cars. 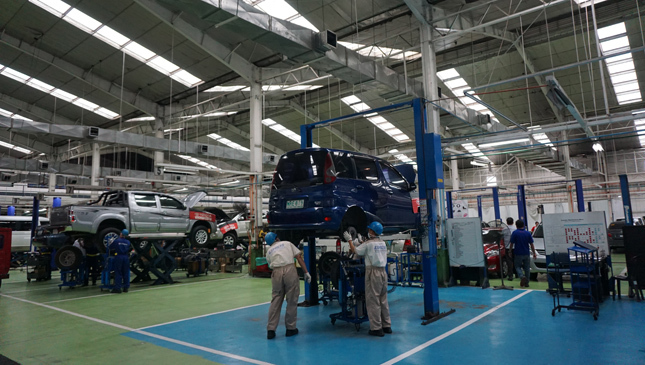 More car sales means more Toyotas that need to be maintained, and so a more efficient way of servicing vehicles is good for all parties. 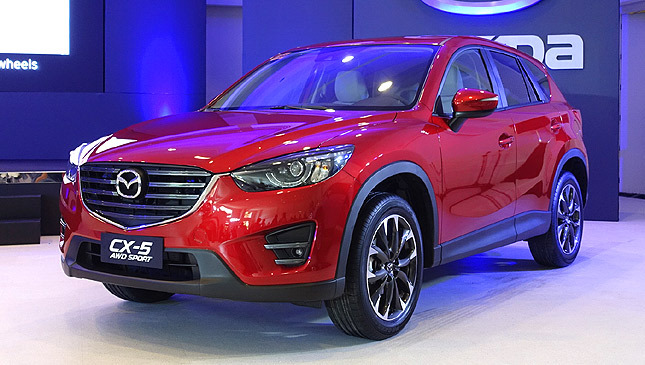 In the end, whether you try this new system or the usual way, never forget your car’s maintenance schedule.